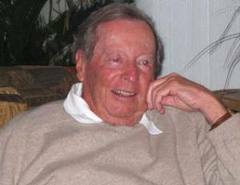 Television news giant Robert Pierpoint died Saturday in Santa Barbara. He was 86. The California native made his reporting reputation with CBS during the Korean War in the early 1950s, and went on to report for the network on six different occupants of the White House. Pierpoint’s war reporting was featured on Edward R. Murrow’s radio show, after which he covered major events of the era, including the assassination of President John F. Kennedy. But he was perhaps best known, at least among colleagues, for wearing shorts and tennis shoes along with his jacket and tie during an on-camera report from the White House Lawn. He later said he was preparing for a tennis match with Nixon press aide Ron Ziegler when he received a last-second assignment from his editors. In an interview last month with the New York Times, he recalled that his superiors were not happy with the situation after the entire photo was printed in a national magazine. His daughter, Marta, said her father savored that incident and the family decided he would be buried in a suit jacket and tennis shorts.